These novellas are like little pieces of crack. They entice me, they consume me, then when I am soaring on the high it gives me… it’s over… and I’m left fiending for my next hit. Which doesn’t come for five long months. I’m already getting the shakes. First of all, if you haven’t read How Beauty Met the Beast, start there. You’re lucky. You can read these two back-to-back. For returning readers, this one picks up a couple months from where the last book left off. 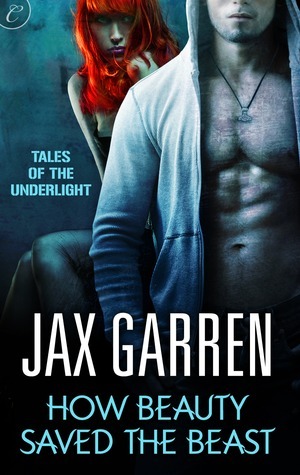 Jolie has been training with Hauk and is now embarking on her first mission with the Underlight. A near-death incident throws the two of them into an embrace that almost leads to more. From there, their relationship begins to evolve from friendship into something more. Basically, this installment is all about how Jolie’s feelings are changing and how Hauk copes with it. Yes, there is still action and violence, betrayals, magic, and secret cults. But let’s be real, people. This is about Hauk and Jolie. I want to see these two together so bad it hurts!! Jax Garren has created this amazing, wounded, powerful, vulnerable hero with Hauk. She doesn’t pull any punches with his appearance though. He is horribly disfigured and she paints such a stark picture of his looks, there is no fooling yourself about how bad it really is. Which makes it all the more poignant. It makes you adore Jolie because she sees the man, not the scars, the piercings, and the tattoos. We’d all like to believe we could do the same, but could we? If we really could, the story wouldn’t have the same kind of impact. It’s not perfect. I had a hard time with the misunderstandings on both sides. But then I remind myself what a short period of time passed in these pages. I just want them together, and I want it now! (*whimpers*) And May is so far away…. I liked this one much better than book one. I still feel frustrated by the world building but I’m in love with Hauk and Jolie. They are so cute together. I love this series too and its hard to wait for the next one you’re right.